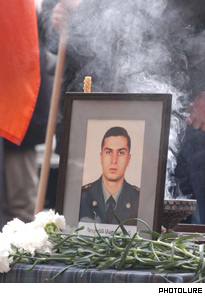 Lieutenant Margaryan was hacked to death with an axe by his Azeri colleague. The slaying of an Armenian military officer by an Azerbaijani classmate at a NATO Partnership for Peace program has heightened tensions between the two countries. Lieutenant Gurgen Margaryan, 26, was hacked to death with an axe as he slept in the early hours of February 19. An Azeri officer, Lieutenant Ramil Safarov, is in custody accused of murder. The Defense Ministry of Armenia condemned the incident as a savage murder unprecendented in its cruelty. Azerbaijan 's Foreign Ministry expressed regret but claimed that 27-year-old Safarov had been provoked by his Armenian counterpart. The two men were attending an English language course in Budapest , Hungary , under the NATO program when the attack occurred. Margaryan had been in Budapest since January 6. Police stated that the Azeri officer burst into Margaryan's room as he slept and killed him with an axe. Margaryan's Hungarian roommate raised the alarm and called police, who reported that Safarov did not resist arrest. Investigators in Budapest refused to comment on possible motives for the crime, but Hungarian Police stated on Monday that the Azeri officer had prepared to commit the crime for a month. They excluded the hypothesis of a conflict between Safarov and Margaryan. Margaryan was a resident of Yerevan and graduated from Yerevan Engineering University . An engineer-economist by profession, he served in the army from 1999 to 2001 then continued his military service in the Logistics Departments of the Ministry of Defense. Friends describe him as a composed and balanced person. Thursday, the body of Gurgen Margaryan was brought to Yerevan airport where representatives of Armenia 's Armed Forces supreme officers' staff met the body of Armenian officer. Relatives of the killed officer and citizens with posters saying Deserved punishment for Azeri criminal and No to murder, massacre were also present at the airport. The funeral of Gurgen Margaryan will take place February 28 in Yerablur cemetery. A Defense Ministry spokesman called the killing the immediate consequence of the activation of bellicose propaganda unleashed by the authorities of Azerbaijan lately and a policy aimed at propagation of animosity. It urged the world community to draw proper conclusions. The ministry noted that a second Armenian officer attending the classes was saved from a similar fate by the intervention of his Lithuanian roommate. The Ministry of Foreign Affairs of Armenia expressed its deep anger at the killing and called on the Hungarian authorities to apply the full force of the law to the perpetrator. This murder is a logical consequence of anti-Armenian hysteria that have been spread by Azeri authorities for many years and bellicose propaganda of recent months with which the entire Azeri community is consistently getting infected, it said in a statement. NATO condemned the killing and expressed hope that the tragic incident would have no impact on Armenia 's cooperation with the organization. This is definitely a criminal offence, which we, of course, strictly condemn. We present our condolences to the family of the murdered officer. For the present moment our thoughts are with his family stated NATO representative Robert Pshchel. Azerbaijan 's Foreign Ministry also offered condolences. But it claimed too that Margaryan was c ontinuously injuring Safarov's dignity as an Azeri officer and citizen. Ramiz Melikov, spokesman for Azerbaijan 's Defense Ministry, told State TV that Safarov was a resident of the Jebrail region whose relatives had been killed during the Karabakh war. Hje said this could have had a negative impact on the Azeri officer's mentality. Until a court renders its verdict nobody has a right to call the Azeri officer murderer. It is not clear yet who has killed the Armenian officer, stated Melikov. The Azeri Zerkalo (Mirror) and Ekho newspapers headed their reports: Who killed Armenian officer in Budapest ? and Azeri military is suspected of killing Armenian officer. 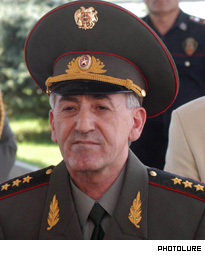 Safarov graduated from the Baku Military College and the Higher School of Turkey's Land Forces. Ecko reported that a Azeri officer attending the Budapest course returned to Baku the day after the incident. Michael Harutyunyan says the side that starts the war first will lose.. Some in Azerbaijan are already turning Safarov into a hero figure. The Karabakh Liberation Organization of Azerbaijan has established a committee of protection for Safarov, which has been joined by a number of public and political figures in the country. Authorities in Yerevan link the incident with the negative position adopted by official Baku towards the participation of Armenian troops in NATO's Cooperative Best Effort 2004 exercises planned for the autumn in Azerbaijan . A delegation from Armenia 's Defense Ministry was prevented from attending a planning meeting on the event in Baku last month. The head of Armenia 's delegation to NATO Vigen Chitechyan met NATO Secretary General Jaap de Hoop Scheffer in Brussels to present a letter from Foreign Minister Oskanian about the killing. The Secretary General expressed his con dolences to Margaryan's family. Youth organizations also expressed their anger in a protest march to the Ministry of Foreign Affairs, where they presented a letter condemning the murder to Terry Davis, the Council of Europe's Parliamentary Assembly rapporteur on Karabakh. Michael Harutyunyan, Deputy Minister of Defense, said the condition of the military in Azerbaijan could not serve as a basis for saying that Baku was preparing to war. I am sure if war starts then the side that will start the war will lose. We are not going to start that war, he said. Thursday, the body of Lieutenant Gurgen Margaryan killed by Azeri officer in Budapest last week was brought to Armenia in a closed coffin. Margaryan will be burried Saturday at Yerablur, cemetery of Karabakh war veterans.